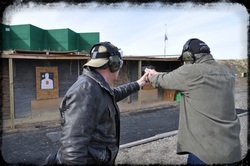 Before you take the Texas License To Carry (LTC/CHL) test, drop by for a quick hour of one-on-one test preparation. We will step through the official LTC/CHL test so you will be ready for the real one at an office LTC/CHL testing center. The goal here is to learn how to efficiently and safely run your gun and make the 50 shots at 3, 7, and 15 yards. Reminder: This is NOT the official test but rather a prep so you will sail through the real thing.